Some exciting new from us here at Cocoatech! We’ve officially begun the development process on Path Finder 7, a new version of Path Finder sure to bring new and improved functionality and features. Stay tuned and follow along as we release more information, such as features, public betas, and dates. We’ll also be holding open forum discussions on our support site next week, where you’ll be able to voice your opinion on both specific features in PF7, as well as talking about PF7 in general. We certainly appreciate the user input, as it plays a major role in our development process. We’ll announce these open discussions on our Twitter and Facebook pages, so be sure to follow those. As always, you can leave feedback and vote on other ideas for PF7 on our feedback page. Apple CEO Tim Cook took the stage in a black shirt and jeans at the company’s Cupertino, Calif. headquarters on Tuesday to show off the latest technology from the company, including new lower-cost 5C models and a fancy new golden iPhone 5S that may be the most important product yet for the technology pioneer. Cook began the day by discussing iOS 7, an update to the software that powers the iPhone and iPad. The new version does away with the 3D effect seen in earlier versions and introduces a simpler new visual style. The new software will be released Sept. 18 for the iPhone 4 and later, iPad 2 and later, iPad mini and 5th-generation iPod touch. But it’s Apple’s much-anticipated new iPhone line-up that fans were most eager for. “Now I’d like to talk about iPhone. A couple of you may be expecting this,” Cook joked to the crowd. In the past, the company has lowered the price on older models when it introduced new ones. This year, the company is instead releasing two new models: a low-cost iPhone 5C and a high-end iPhone 5S — and yes, it comes in gold. “A few of you might have seen some shots on the web. And that’s cool, because everyone is really excited about this,” explained Phil Schiller, senior vice president of marketing. 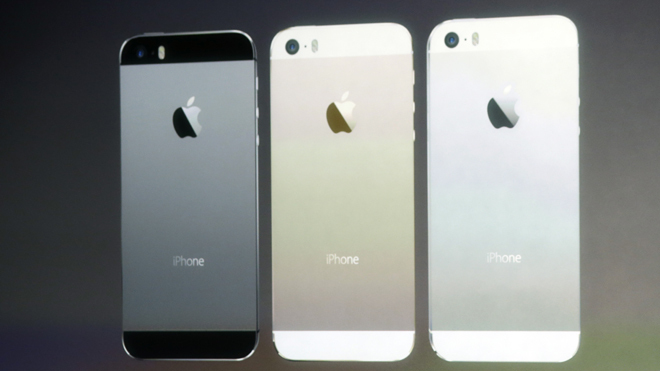 The iPhone 5S is made of aluminum and comes in silver, gold and slate gray, and it includes a fingerprint sensor for security– a new feature Apple calls the Touch ID sensor. The sensor is built into the home button on the bottom of the smartphone. “You can simply touch your home button to unlock your phone,” Schiller explained. The phone is powered by a new chip called the A7 that Schiller called the first ever 64-bit smartphone chip. It packs in over a billion transistors, Schiller said, and is “over twice as fast” as earlier processors. Graphics are 56 times faster, he said. The iPhone 5S also has an impressive-sounding camera on the new phone that includes an Apple-designed lens and image sensor system, as well as a special flash designed to improve color balance. Apple calls it “the iSight” camera.The 5Swill sell for $199 for a 16GB model, $299 for the 32GB version, and $399 for the top-end 64GB version; it will be available on Sept. 20 in the U.S. and eight other countries, including China. Meanwhile, the iPhone 5C is a lower-cost plastic model wrapped in one of five colors: lime green, white, yellow, red and bright blue. 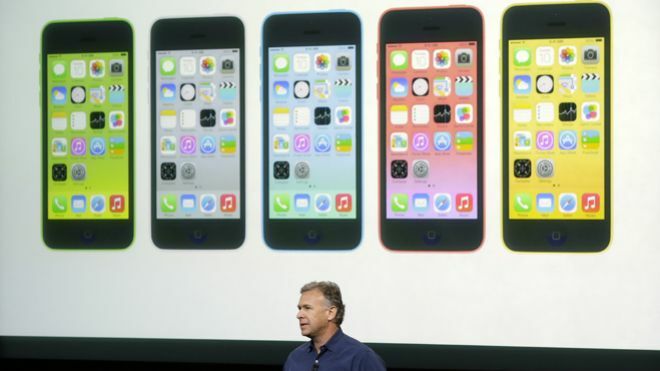 It has a 4-inch Retina display, and the same 8-megapixel rear camera and A6 processor as the iPhone 5. But the new model has a front-facing camera as well; it will cost $99 for a 16GB model, and $199 for 32GB. Apple took the wraps off the iPhone 5 last September. The company has never waited longer than a year to update the iPhone, which has generated $88 billion in revenue during the past year. Apple’s timetable for rolling out products has vexed many investors who have watched the company’s growth slow and profit margins decrease. Meanwhile, a bevy of smartphone makers, most of whom rely on Google’s free Android software, release wave after wave of devices that cost less than the iPhone. Those concerns are reflected in Apple’s stock price, which has declined nearly 30 percent since peaking at $705.07 at about the same time the iPhone 5 went on sale last year. The Standard & Poor’s 500 index has risen about 14 percent during the same stretch. Even though Apple’s market value of roughly $460 billion is more than any other company in the world, the deterioration in its stock price is escalating the pressure on CEO Tim Cook to prove he’s the right leader to carry on the legacy of co-founder Steve Jobs. Since Cook became CEO two years ago, Apple has only pushed out new versions of products developed under Jobs, raising questions about whether the company’s technological vision has become blurred under the new regime. What do you think of Apple’s recent announcements? What’s got you excited, and what are you not too happy about? Let’s hear it! We’ve released Version 6.0.10 for Snow Leopard, making it the final Snow Leopard version released for Path Finder 6. The Cocoatech team has put out a lot of versions for the older Snow Leopard OS, constantly adding features and taking care of bugs. We feel the time has come to move on to bigger, better, and newer things, so that’s what we’ll be doing! We’ve got some exiting things up our sleeve at Cocoatech! Stay tuned! 1. Fixed Desktop icon moving bug. Version 6.2.1 for Path Finder 6 has been released and is available to all licensed users of Path Finder 6 as a free download. To update, click “Check for Updates” in the Path Finder menu. *When Dual Pane divider is placed in the center, centerd Dual Pane is automatically turned on. Turned off by moving divider manually. Dual-Pane mode divider functionality change: When divider is dragged to the center, centering will be automatically turned on. Any further resizing of the window will keep both panes the same size. If a user drags the divider to any other position (not in the middle), centering will be automatically turned off. Path Finder recently placed 2nd in LifeHacker’s “Top 10 paid apps”. The article, which can be viewed below, pitted the best selling and most useful apps against each other. Cocoatech is proud to receive such recognition for Path Finder, an app we’ve been so adamant on improving daily. While we think Path Finder is pretty darn impressive already, we never lose the drive to come up with ways to make our app even better. A main cog to that are our users, who have always provided us with apt and useful feedback. We really appreciate such involved and dedicated users, and we thank you endlessly. Get ready for an awesome update coming soon!